The Barnard Student Government Association’s most recent referendum has been a flash point on Barnard’s campus and beyond; op-eds have been penned by students of Barnard and Columbia, by alumni, and by strangers. Important questions have been raised about why and how SGA chose to hold this referendum—a similar request by student activists was rejected on Columbia’s campus just last year, never reaching a referendum. As SGA’s representative council is preparing to meet this evening to vote on next steps, we, SGA’s executive board, came to the conclusion that students and the broader community needed to hear both an unadorned account of the referendum timeline, and our argument for more referendums moving forward. From the beginning of our tenure as the executive board of SGA, we made it our first priority to amplify student voices. 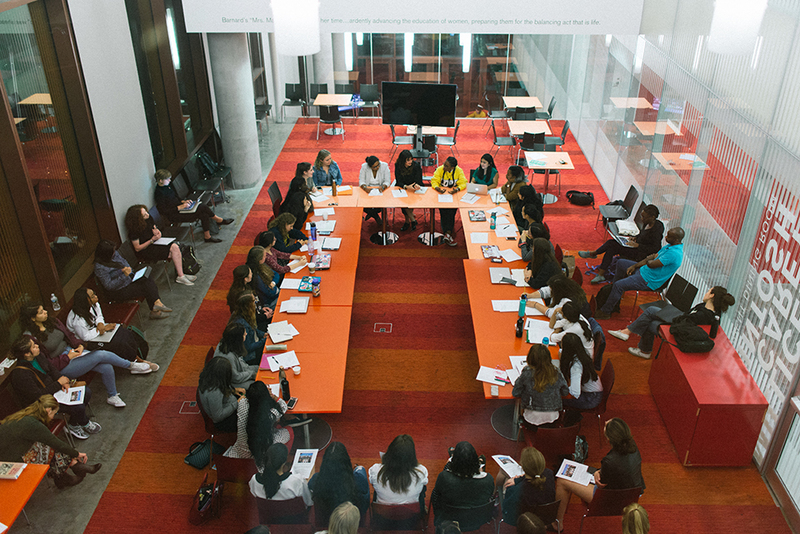 Throughout the year, we’ve met with a range of student groups, such as Student Worker Solidarity, Barnard Organization of Soul Sisters, Mujeres, and Nightline. As a body tasked with representing students, we believed it was our responsibility to hear and respond to our constituents directly. This increased engagement with students led us to release three statements of support over the course of the year, one of which led Barnard to affiliate with the Workers Rights Consortium, ensuring that the rights of workers who make Barnard apparel are protected. On Feb. 12, the executive board received an email from Columbia/Barnard Jewish Voice for Peace and Students for Justice in Palestine requesting to present on behalf of their coalition, Columbia University Apartheid Divest. They intended to discuss their campaign and request a statement of support: a letter from SGA to the Barnard administration, advising the college to divest from eight multinational companies that profit from or engage in the State of Israel’s treatment of Palestinians. At our Representative Council meeting on March 19, the room was filled with students, both for and against the divestment campaign. We listened to CUAD’s presentation knowing that SGA could not, in good faith, vote to issue a statement of support that evening. We could not respond to CUAD’s request without first holding a referendum to assess support for the initiative among Barnard’s student body because of the political nature of the issue. During the internal portion of the meeting, a motion was made to hold a referendum and it passed with a simple majority. This vote could have been modified—had three members of the Representative Council, including one executive board member, motioned to change the threshold from a simple majority to two-thirds, then it would have been more difficult to pass the vote to hold a referendum. No such motion was passed, in part because no executive board member felt that a decision could be made without a referendum. The executive board believed then, and continues to believe now, that although the Israeli-Palestinian conflict is a contentious subject, the decision to hold a referendum was not contentious. Asking the students we represent for feedback is not radical, and the executive board felt that any move to prevent a referendum would call into question the Representative Council’s ability to represent students. Based on these presentations, the executive board set out to draft a document that would accomplish the goal of the referendum, gauging student support for CUAD’s argument that Barnard should divest from eight companies that profit from the exploitation and oppression of Palestinians. We also made it a point to respect the request from members of Aryeh and Hillel that certain inflammatory words such as “apartheid” be omitted despite their presence in CUAD’s ask. Before the drafting of the referendum began, we held separate meetings with the leadership of CUAD, Aryeh, and Hillel respectively. We have since received questions about why the referendum didn’t call for divestment from all companies that profit from war and occupation. The answer is driven by process. CUAD’s statement took a clear position on a specific issue, and in order to respond to its request for support, SGA needed to know where the student body fell on that issue. It is for this same reason that the executive board maintained specificity by not asking students about their support for Israel in general or the boycott, divestment, and sanctions movement at large. In writing the referendum, the executive board reviewed publications from organizations including Human Rights Watch and Amnesty International, as well as a range of international news sources including those from Arab and Israeli press. In regards to providing citations for the text of the referendum, we worked to keep it as objective as possible with information that could be corroborated by multiple sources, acknowledging that campaigns were actively providing literature. After the text of the referendum was drafted, the Representative Council approved its wording with a simple majority vote on April 2. We asked all groups to adhere to campaigning guidelines to maintain a free and fair election, in the same way that we hold all students to election guidelines, regardless of if they are running. There were multiple violations on each side of the campaign, everything from defacing campaign posters, to the use of sponsored posts on Instagram and Facebook, in direct violation of SGA’s campaign financing rules. SGA executive board investigated each report of a campaign violation, actively choosing not to punish but rather correct violations, as to make the campaign process as fair and equitable as possible. 49.9 percent of Barnard’s student body voted on the referendum, solidifying a significantly higher voter turnout than any Barnard student body vote in recent history and the referendum passed with a significant majority. We want to be honest and direct: There are some students and alumni of Barnard, and many strangers to our campus, who do not like that SGA chose to hold a referendum, who take issue with its phrasing, with its process, and with what it represents. But our primary responsibility as SGA is to represent the student body, and we are better able to do so now that we know the votes of the 1,153 Barnard students who participated in the referendum. We believe in the power of referendums, and think that they are the best tool for student governments to transparently represent the interests of their constituents. Moving forward, we encourage students to come to SGA to voice their opinions about any issue, whether it be a broader anti-war effort, support for 24/7 Columbia’s campaign for extended health services, or divestment from companies that profit from what students believe is unethical behavior. Although our tenure is soon ending, we are confident your concerns will continue to be met with the same respect that we have endeavored to show all issues brought before SGA this year. SGA has been, and will continue to be, a tool for amplifying student voices and facilitating positive change at Barnard. Angela Beam is a Barnard senior and the president of SGA. Alicia Simba is a Barnard junior and the SGA Vice President of Policy. Evelyn McCorkle is a Barnard senior and the SGA Vice President of Finance. Aku Acquaye is a Barnard senior and the SGA Vice President of Campus Life. Rhea Nagpal is a Barnard junior and the SGA Vice President of Communications.